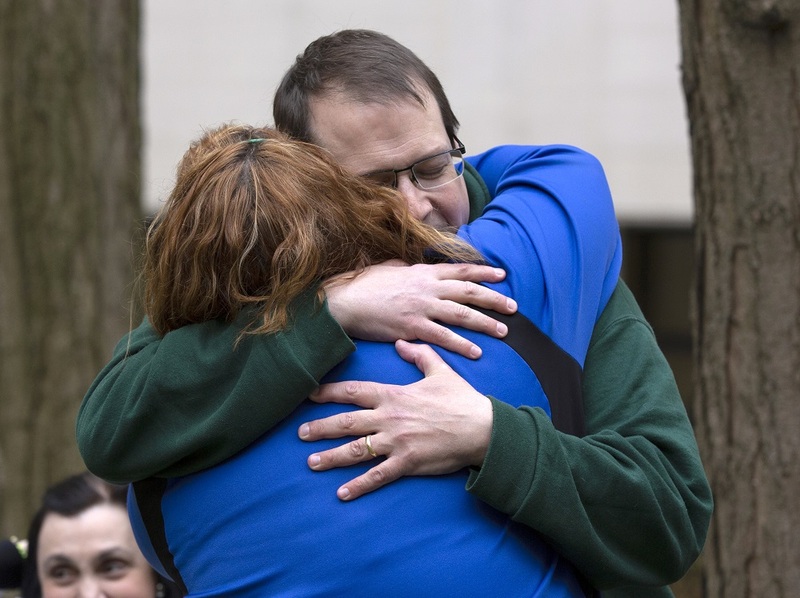 Liver transplant recipient Bill Griffis embraces physician assistant Brooke Olenowski during Blue and Green Day. Penn State Health and Penn State College of Medicine employees, faculty and staff celebrated Donate Life America’s Blue and Green Day on April 12 with testimonies from organ recipients, refreshments and even a little dancing. An average of 20 people die each day because the organs they need are not donated in time. Donate Life America reports that 95 percent of Americans are in favor of being an organ donor, but only 58 percent are registered. Blue and Green Day at Penn State Health Milton S. Hershey Medical Center aimed to increase the number of registered donors. 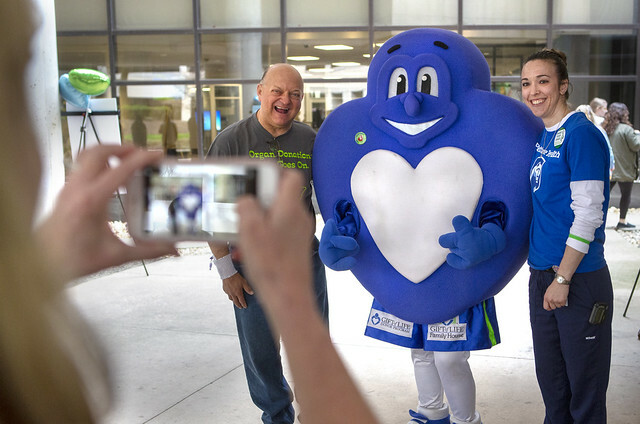 Employees and students wearing blue and green had the opportunity to learn how they can save a life through organ donation by talking with members of the transplant team, living donors and organ recipients. One person’s organ donation can save up to eight lives, and their tissue donation could help up to 75 lives. Many organs come from deceased donors, but the wait for an organ from a deceased donor can range from five to eight years. Living donation affects both the recipient and donor. Dorlee Martin, who’d been released from the hospital a few days before Blue and Green Day after donating a kidney, attended the event to advocate that those who can donate should. Her kidney donation benefitted three lives. Miranda Feliz Garcia received a living donation from her brother after losing both of her kidneys in a car accident. She echoed Martin’s sentiment in her remarks at Blue and Green Day. “Today is mainly about my donor,” said Bill Griffis, a former transplant patient. He has traveled to many places since his transplant, including the Grand Canyon, but says that he never forgets the person who made it possible. He leaves little notes for his deceased donor at each place he travels to as a way of offering his gratitude. Griffis thanked Dr. Zakiyah Kadry, transplant surgeon, and the staff at Hershey Medical Center for their exceptional care in his address to the crowd. Kathy Yandle, manager of hospital services for the Gift of Life Donor Program, presented Kadry with an award for Hershey Medical Center’s outstanding commitment to community and clinical education on organ donation. Members of the crowd then broke out into a spontaneous dance routine to Lady Gaga’s “Edge of Glory.” Registered donors are “on the edge of glory” as their gift will one day benefit the life of another. Pennsylvania residents can register to be an organ donor on the Pennsylvania Department of Transportation website. Transplant services are also available in Lancaster County at Penn State Health Medical Group – Lime Spring.